The first thing that you’ll notice when you come into the pub is that it’s exactly how a great pub should be. Nothing fits and nothing’s normal – from the wonky flagstone floors to the even wonkier walls. The tables and chairs also sit at their own unique angles as do some of the more mature gents, sipping pints of what they will declare is orange squash. But don’t be taken in by their gentile charm – in their glasses be scrumpy!! A local delicacy only recommended for the more experienced drinker among you, or those of you that have nothing to do tomorrow. 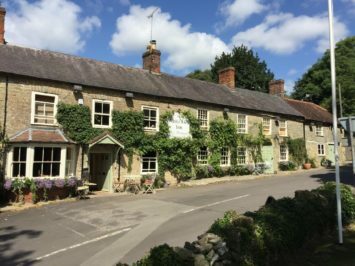 Being a proper pub you’ll always find a warm welcome from the locals who support us with an infectious enthusiasm that’s not solely down to the scrumpy. There’s usually someone here who fancies a chat, a joke and a chance to put the world to rights. Thatcher’s are our mainstay ciders, both Gold and traditional dry, from a Somerset based family company that have been making great cider for over 100 years. The real ales we currently offer are Ruddle’s Best or Otter Amber, both great beers but we’re always open to suggestions for guest ales that you recommend and would keep you coming back.